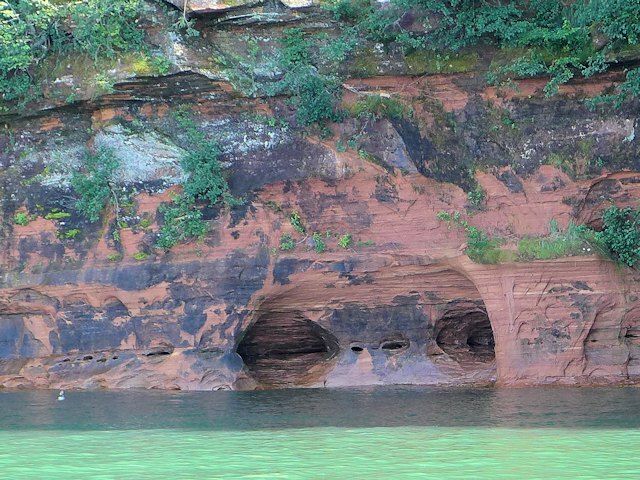 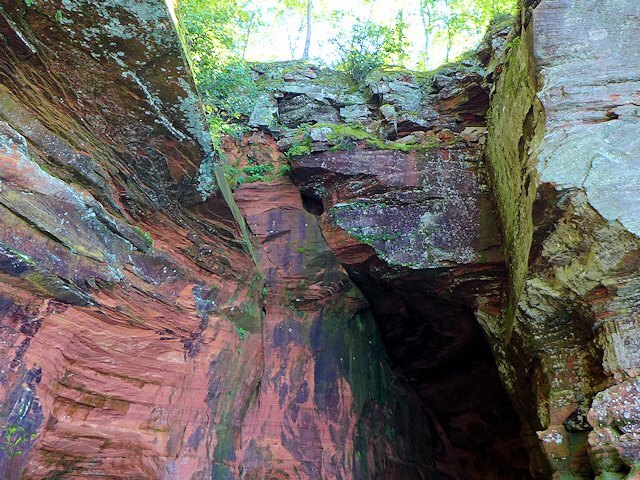 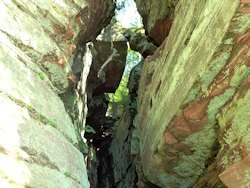 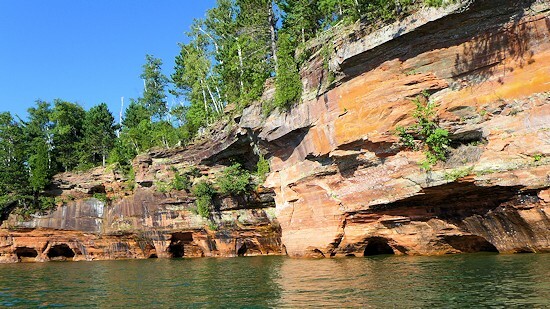 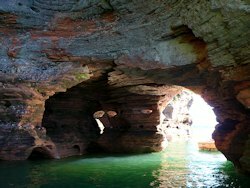 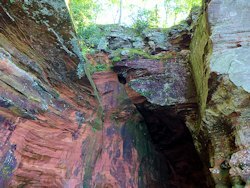 There are many ways to see the Sea Caves of the Apostle Islands National Park. 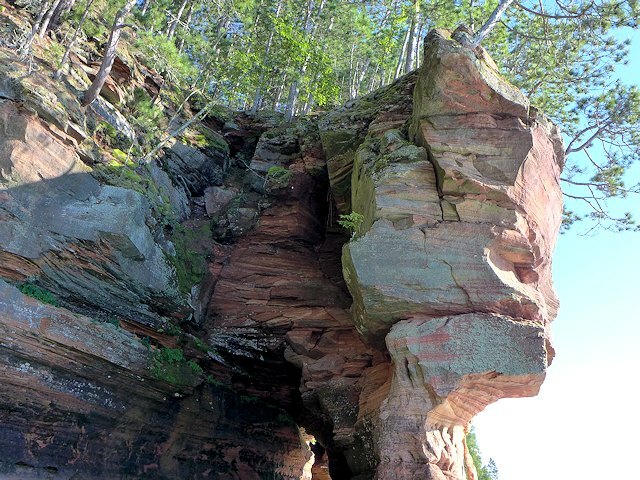 During the spring, summer, and fall you can hike to the Sea Caves along the Lakeshore Hiking Trail. 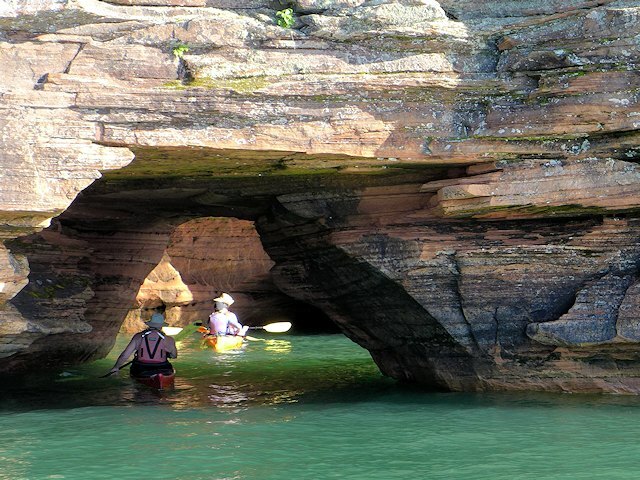 or Kayak from the Meyers Beach landing in the National Park. 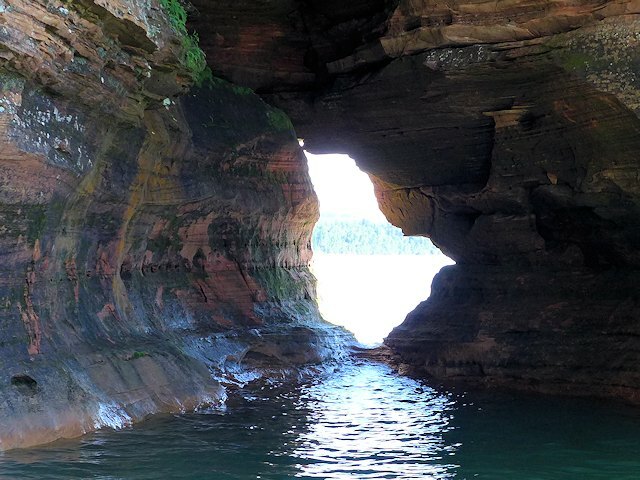 You can also do a Sea Caves Tour from Cornucopia by boat or kayak. 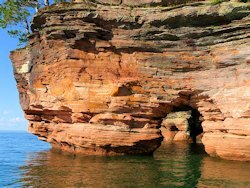 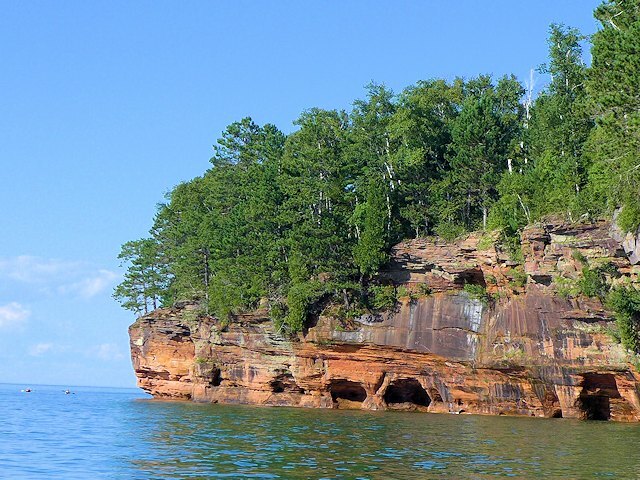 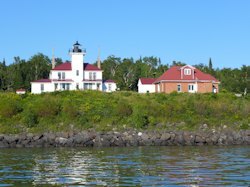 And from Bayfield there are several tours offered by the Apostle Islands Cruise Service. 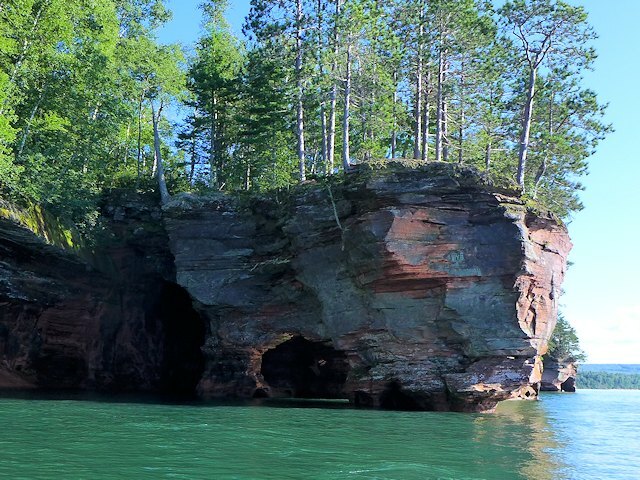 See the Apostle Island Park Snow & Ice Caves in the Winter. 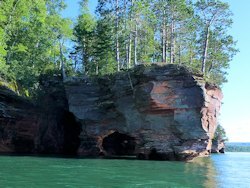 In the wintertime, when the ice is safe, the most popular means of seeing the ice caves, up close and personal, is to hike to the Apostle Islands-Bayfield Winter Ice and Sea Caves from the Meyers Beach Landing. 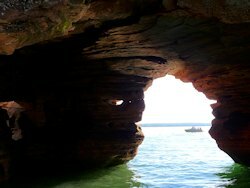 We've been lucky to catch the Ice Caves on two occasions when the ice was safe enough to cross. 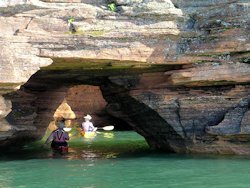 Unfortunately these occasions are getting rarer. 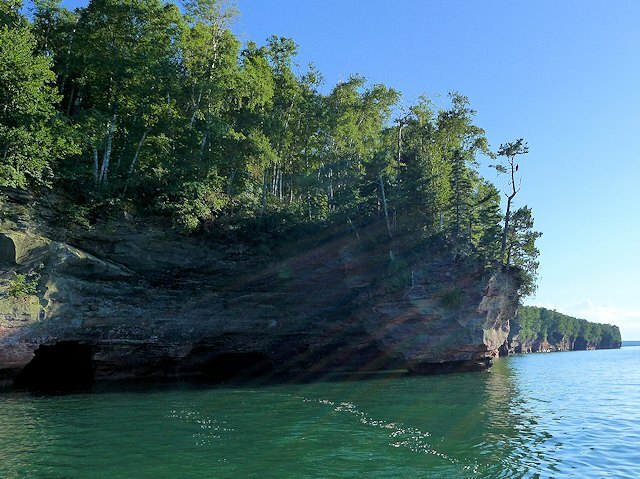 In the summer of 2016 we chartered cruise with Captain Mike Garnich of Good Earth Outfitters from Cornucopia, Wisconsin to see both the mainland Bayfield Sea Caves and the Sea Caves of Devils Island. 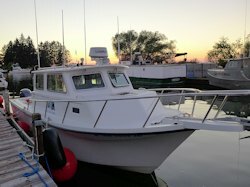 To follow are photos from this cruise. We've taken and enjoyed other Apostle Island's cruises (Apostle Island's Grand Tour and Raspberry Island Lighthouse Tour) on larger (65 feet) cruise ships, but one thing we appreciated about Captain Mike's ship, and how he conducts his tours, is he can get within a few feet of many of the cave walls plus more easily customize the tour around the interests of his passengers because there is generally fewer than eight people on a given cruise (on ours there were only four of us). 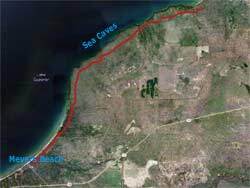 Here's an aerial view from Google Maps of the Sea Caves and the Meyers Beach Landing popular with kayakers paddling out to the caves. This is also the trail head for the Sea Caves hiking trail. 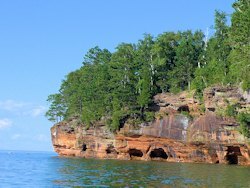 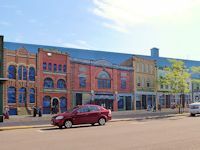 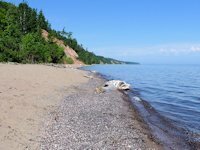 Things to see and do in Bayfield, WI - events, festivals, special attractions. 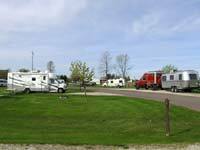 Bayfield Apple Festival - Northern Wisconsin's oldest and most popular fall festival. 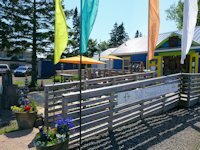 Cornucopia Wisconsin - quaint seaside village west of Myers Beach.